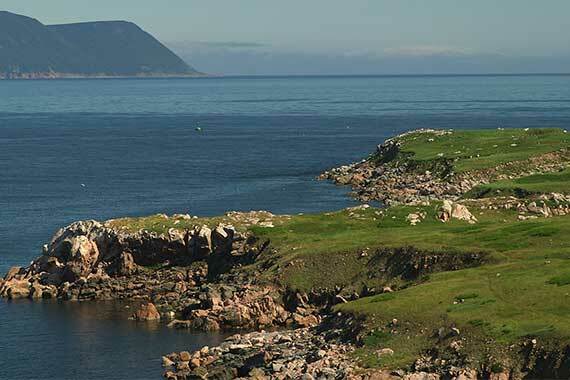 Access Information: From Neils Harbour, drive 13 km (8 mi) along the Cabot Trail toward Cape North and Dingwall. Road signs indicate the turnoff on the right near the bottom of a long descent toward the ocean. Follow the unnumbered road for 14 km (8.75 mi), turning left and dropping sharply for 1.5 km (1 mi) to the village of White Point. At end of the paved road, by mailbox #2119, continue straight up dirt road for less than 100 m/yd, parking your car in the wider area. The trail is a continuation of the road. Introduction: White Point provides some of the most dramatic coastal scenery of any trail in Cape Breton. From its favoured position on the southern end of Aspy Bay, the grand sweep of both the beaches at the mouth of the Aspy River and the stark ridge of North Mountain across the far skyline are visible, as is St. Paul Island, the northern outpost of Nova Scotia. Formerly the site of a French fishing village, the original English grantee was James Fitzgerald, in 1825. The community’s first church was established in 1872, a lobster factory by 1904, a school in 1920, and a sawmill in 1922. A small cemetery is located near the tip of the point. Please restrict yourself to recognized footpaths. The vegetation on the point is quite fragile and can easily be disturbed by the many visitors. Cautionary Notes: Cliffs. The entire hike is on an exposed headland where the temperature can be much lower than inland, and waves can break savagely on the rocks. Carry warm clothing.